There are two ways to increase conversion: get more qualified traffic or turn more of that traffic into leads, sales and subscribers. SEO is key for the first of these: visitors that need what you offer. 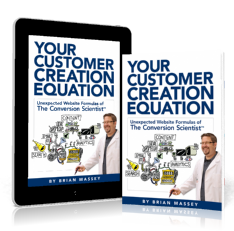 Here is an excerpt from Your Customer Creation Equation on Search Engine Optimization (SEO). Regardless of how good your advertising and marketing are, one thing is certain: More and more of your traffic is going to come from search engines. The top search engines on the Internet now include Google, Bing, and YouTube, and these are influenced by social sites like Facebook and Twitter. Social networks benefit from a community that helps to sift and tag your content. Google, Bing, and YouTube suffer from a fundamental lack of comprehension. Your site has the burden of communicating its content and value to these search engines, and it’s a lot like talking to the autistic savant Raymond from the Tom Cruise movie Rainman. Raymond was the character who could repeat facts and do calculations with amazing precision. However, Raymond—like the search engines—could only understand the literal meaning of what he heard and read. Google has made efforts to reward sites that have plentiful content, and prefers sites with frequently updated content. Hire an SEO specialist to ensure that your content is being found by the search engines. Your efforts will be rewarded with increased standing for your site, which will translate into more traffic. They talk about traffic, not ranking. If they are overly focused on your ranking, proceed with caution. You can easily rank for keywords that aren’t being searched, or for keywords that bring the wrong kinds of eyeballs—eyeballs that don’t want what you offer. They are picky about the pages they send traffic to. The best SEO firms have a conversion practice. They will want to optimize pages that are designed to convert visitors. You can optimize the home page for search all day long, but it is your product and landing pages that will convert search traffic best (as you will soon discover). That is what they are designed for. Hire a search resource that is focused on optimizing effective pages. Original content is a key to their strategy. The algorithms that Google and Bing use to prioritize websites like yours change once or twice a year. One strategy that seems to be consistently effective is original content. Your search engine translator should encourage you to use original content to create keyword-rich content for your site, to place that content on other sites, and to use it in social media. These activities work to build the authority of your site.